They were not often used to convey a strong emotional feelings or ideas. The concept of the Mother was often conveyed via a pictogram or using a number of symbols which when put together convey a different meaning and tell a story. There are a number of mother symbols including the circle symbol, the turtle and the Tapuat. In Lakota Sioux mythology, Chapa is the beaver spirit and and symbolizes domesticity, labor and preparation. For additional information refer to the Family Symbol. The Tapuat is the Hopi symbol for mother earth which depicts a maze. The Hopi name for Mother Earth is 'Tapuat' meaning mother and child. Like the Man in the Maze Symbol of Life this icon is depicted by a series of a form of concentric circles and symbolizes the cycle of life and the path followed on the journey of life experienced by a child under the watchful eye of the mother. The lines symbolize the umbilical cord and birth, the cycle of life on its earthly path, the spiritual domain and rebirth. The lines and passages within the "maze" represent the universal plan of the Creator and the path that man must follow to seek enlightenment, which is often guided by the mother. Anog Ite was a Sioux deity and said to be the mother of the Four Winds and the whirlwind. She causes pains to pregnant woman and makes babies cry. She was also said to have taught the Lakota how to separate porcupine quills and dye them. The symbol of the mother can be depicted as a woman surrounded by a circle. A circle around other Native American symbols signifies family ties, closeness & protection. The circle has no break and holds that which cannot be broken. The circle is used as a basis for many symbols including the cycle of life from birth to death to rebirth. 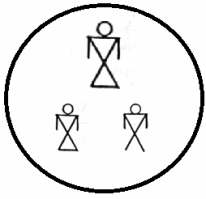 The woman symbol in a circle is combined with the symbols for a boy and girl, this can be interpreted as a mother and child symbol. It might also be interpreted as a symbol of a grandmother. The Symbol for Sisters depict a similar icon with two women who are positioned side-by-side representing unity and equality. The Symbol for Brothers are represented by a similar sign. The turtle symbol is revered as a sign of motherhood and the earth mother. The earth mother features in many Native American Indian myths and legends and is honored for saving mankind from the Great Flood. The turtle symbol of the earth mother represents her stoic ability to carries the heavy burden of man on her shell. Many species of the turtle have 13 sections to their under side believed to represent the cycle of the thirteen moons. The moons are a celestial symbol of motherhood. The Mother Symbol might also be conveyed via a combination of the Native American symbol for a woman and the cactus. The woman symbol is self explanatory but the cactus symbol needs and explanation. The cactus plant symbolizes warmth, endurance and protection. The yellow cactus flower is a symbol of maternal love because it can endure and thrive in harsh conditions and therefore symbolic of the unconditional and enduring love and protection of a mother. The protective qualities of the mother are conveyed by the cactus flower due to its medicine. The pulp and juice was used to treat numerous wounds and sickness such as inflammations of the digestive and urinary tracts.